PayrollPanda — How does "PCB borne by employer" affect my payroll? Help Center Home App How does "PCB borne by employer" affect my payroll? How does "PCB borne by employer" affect my payroll? When PCB is borne by the employer, the employee will have no PCB deducted from their gross pay. PCB borne by the employer is a taxable perquisite to the employee and the total perquisite is added to the taxable income of the employee in the following tax year. This means that the employee only has their usual EPF and SOCSO mandatory deductions deducted from their gross salary. 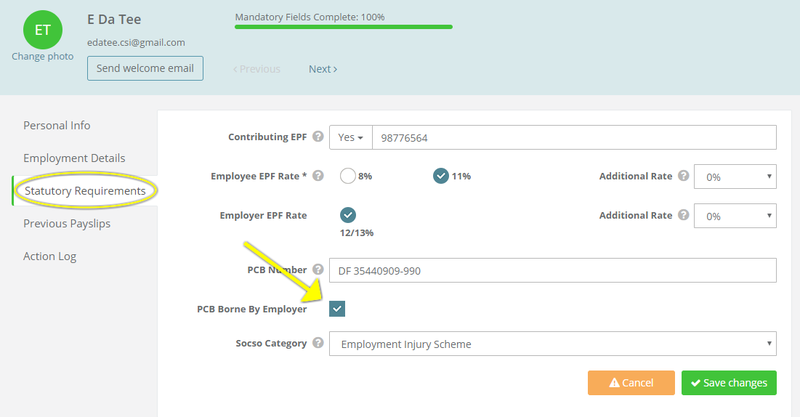 By clicking the box, the PCB deduction will not affect the employee's net pay.